Ed at entrance to Auschwitz concentration camp outside of Krakow, Poland at the end of his time ministering in Radom and Poznan, Poland in September 2002. Being a Messianic Jew, this held special significance. 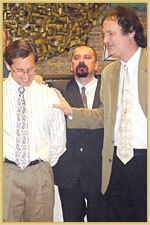 Ed praying for each of the five evangelical pastors in Radom, Poland in October 2003, who had gathered together on his last night there. Please pray for that city! Picture taken teaching nationals who are new missionary students at the Mission School in Odessa, Ukraine, in October 2004. Please pray for the ongoing work of that school! Photo taken during small group discussion time at 2007 Men's Conference when Ed taught in Poland. "We are only limited by our prayers. We might see greater things if we could but believe. All things are possible to him that believeth ... but the Lord Jesus cannot do many mighty things now-a-days, because of our unbelief. We hamper the arm of grace; we do, as it were, restrain the Almighty energy." "O for greater faith to believe that multitudes may be turned unto God at once, and we shall yet see it -- see what our fathers never saw, and what our imaginations have never dreamed." 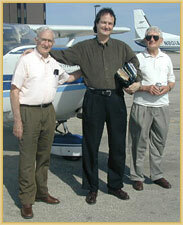 May 17th through 22nd - Washington D.C.
Ed Kleiman with friends Frank Brown and Dale Aunspach taken at the airport in Cedar Rapids, Iowa, after preaching at the Cedar Hills Evangelical Free Church there.